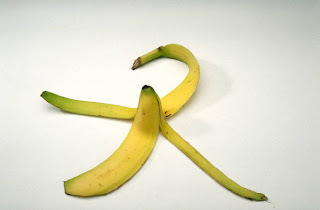 Speak Schmeak: Eat bananas for public speaking success! Eat bananas for public speaking success! There are also a couple of charts, one showing a list of potassium-rich foods, in case you don't like bananas, and another demonstrating steps for weaning oneself off caffeine! Check out the article for more on Professor Deletis' philosophy on reducing public speaking fear. I would have to agree with that, Santosh! Or "Enthusiasm"! He stole my thunder. I was about to reveal (to great acclaim) my beer and potato chip diet to public speaking success. Darn you Harvard Business School Professor Dale Deletis! Ross, I would LOVE to hear about your beer and potato chip diet. Tell me, would I become successful at public speaking AND perhaps also lose weight on this diet? Lisa, all I can say right now is that it's worked for both my friends. Both of whom are powerful orators and waif like thin. Now, just the question of, how to bring it to market and make my millions...?